Did you know your cluttered home is having an adverse affect on your health? In this consumerist society where we tend to accumulate far too much “stuff”, the clutter that results has taken a toll on our stress levels. That direct link between excess home clutter and higher stress levels has been made in numerous studies in recent years. Our home is supposed to be our private refuge, but its value as a comforting space declines if it’s not kept in an orderly fashion. Get educated on the harmful effects of living in a cluttered home and what can be done to fix this problem. A study conducted by Princeton University Neuroscience researchers found that a cluttered home environment impedes your ability to focus. When we have a hard time focussing, our mental faculties get worn down and frustration ensues, causing stress. Struggling to focus properly also inhibits our ability to be creative and to problem solve. The Yale School of Medicine published a study that revealed some surprising results. When the study’s participants who were less inclined to throw away things were forced to part with belongings, researchers found increased activity in the areas of their brains that are associated with conflict and pain. It literally hurts some of us to part with things we own. Findings from UCLA researchers showed that women who had an increased level of clutter in their homes also had higher levels of a stress hormone known as high cortisol. Their study also found that the tidier a home was, the happier its occupants seemed to be. On a less scientific level, but still worth a mention, is a recent Huffington Post survey of 1,000 U.S. adults. In it, 81% of men and 87% of women expressed some level of anxiety over how organized their home was. “Worrying my home isn’t clean or organized enough” came fifth on their list of the most common stress triggers in their lives. When you live in a cluttered home, there’s a constant feeling of guilt (even if you’re not fully aware of it) over the disorganized state of your space. Our brains are always telling us there’s still plenty of work to be done, which makes it harder to relax. Buy less. Really evaluate the necessity of your purchases and weigh the pros and cons of how much they’ll enrich your life. We often buy things with the best of intentions of using them, but ask yourself if you’ll realistically be using something you’re considering purchasing a year from now. Eliminate your non-essential belongings. Even if the trendy minimalist lifestyle isn’t for you, it isn’t difficult to live with fewer things. Just about all of us own many things that get little to no use. Purge them from your life and home clutter will be more manageable. Get the rest of your family involved and don’t be overwhelmed at the prospect of cleaning out your home clutter – it doesn’t have to be accomplished overnight. Use smart home storage solutions. Naturally, investing in smart ways to improve your storage and organization efficiency in the home isn’t included in the “buying less” category because of the long-term benefits they’ll provide on a daily basis. Smart home storage solutions give you the ability to tidy up your space and keep it clutter-free. And these solutions are not only functional, their stylish designs will also enhance your home’s decor. Maintain your clean space. Custom home storage solutions do make it easier to keep your house or apartment clean and organized, but your family still needs to put forth their best efforts in maintaining their clean space. 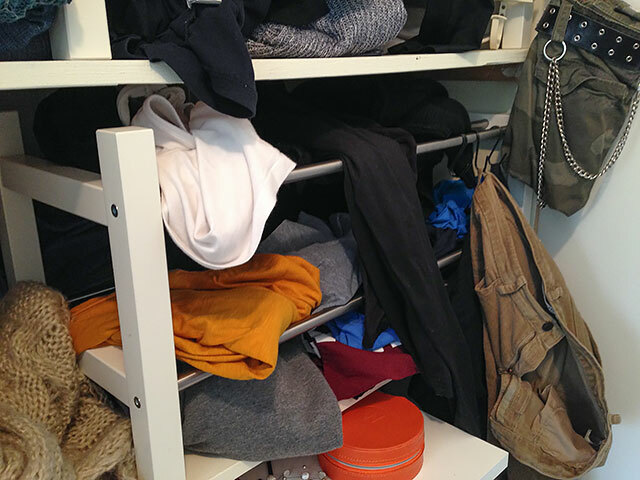 Put things away once you’re done with them in the dedicated homes that home storage solutions provide. Now that you’re aware of the stressful effects of living in a cluttered home, what steps will you take to combat this problem? Lowering your home’s stress levels by creating a more calming, clutter-free environment that will do your mind and body good is easier than you might think. To get started, schedule your free in-home consultation with one of our designers today.